I always thought Soy Milk was made with soy beans and shrank your nads because it increased estrogen in the body, but I was totally mistaken. 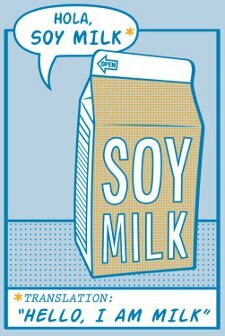 Soy Milk is really just a bit of Spanglish on a carton of regular cow’s milk. Glad that’s been cleared up. If everyone just tells one other person we can educate the world on this issue. Better yet wear this Hola Soy Milk T Shirt around and make sure people read the part where it says Translation: Hello I Am Milk. Okay? Snorg Tees doing public service all the time. They are egoless saints. Soy milk is good and healthy drink.